The paper addresses important issues regarding how consumers' purchase decisions in a product category are influenced by market mix variables in other categories. We propose a structural analysis of multi-category purchase decisions, where we simultaneously model and estimate consumers' purchase incidence, brand choice and quantity choice decisions across multiple product categories. Addtionally, we study the role played by umbrella brands in influencing the decision made by consumers. We propose a structural model where all the three decisions are derived from the consumer's global utility maximization. Such structural analysis is important from the perspective of (i) a retailer whose objective is to maximize profits over all product categories, and (ii) a manufacturer whose objective is to maximize profits over its entire product line. Our analysis highlights the importance of studying consumers' purchase decisions in a multi-category context which can not be addressed by studying each category in seclusion. Yu, Ma, Nitin, Mehta, & Sangwan, Hemant. (2007). 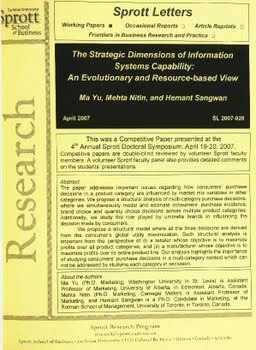 The Strategic Dimensions of Information Systems Capability: An Evolutionary and Resource-based View. Sprott Letters, April(2007).